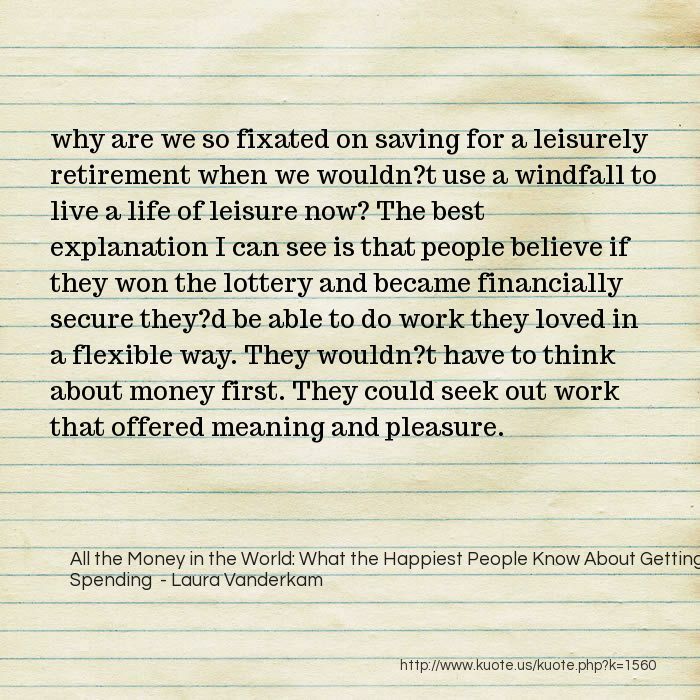 why are we so fixated on saving for a leisurely retirement when we wouldn?t use a windfall to live a life of leisure now? The best explanation I can see is that people believe if they won the lottery and became financially secure they?d be able to do work they loved in a flexible way. They wouldn?t have to think about money first. They could seek out work that offered meaning and pleasure. why are we so into this idea of retirement in the first place? The answer seems obvious. Who wouldn?t prefer leisure to labor? Almost everyone talks of wanting to retire someday, and pretty much every major financial decision the experts tell us to make is designed with this goal in mind. We talk of building up wealth so that at some point we can stop working, preferably when we?re young enough to enjoy ourselves. 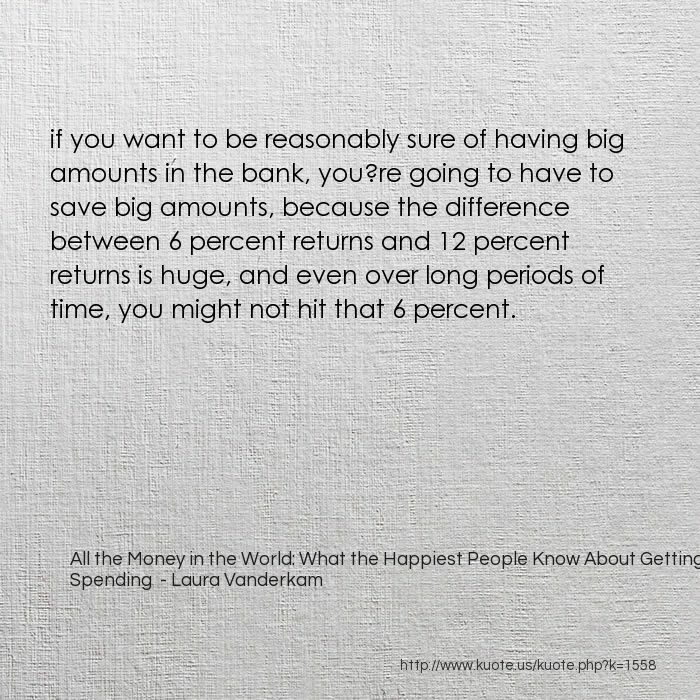 if you want to be reasonably sure of having big amounts in the bank, you?re going to have to save big amounts, because the difference between 6 percent returns and 12 percent returns is huge, and even over long periods of time, you might not hit that 6 percent. 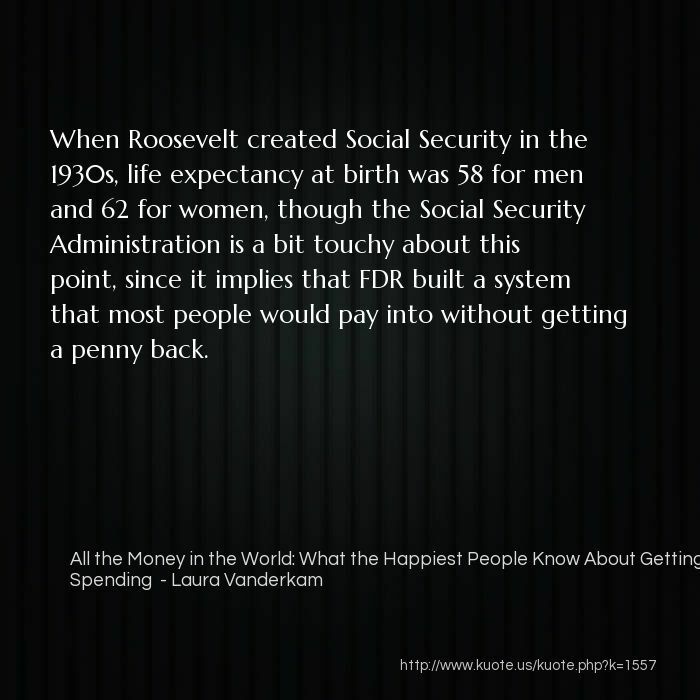 When Roosevelt created Social Security in the 1930s, life expectancy at birth was 58 for men and 62 for women, though the Social Security Administration is a bit touchy about this point, since it implies that FDR built a system that most people would pay into without getting a penny back. In addition to guarding against old-age poverty, some policy makers saw another benefit to pensions. 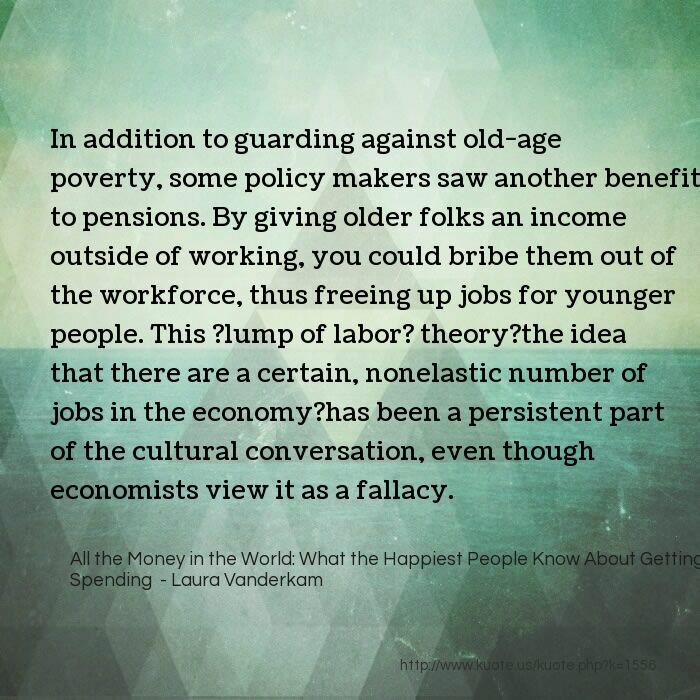 By giving older folks an income outside of working, you could bribe them out of the workforce, thus freeing up jobs for younger people. This ?lump of labor? theory?the idea that there are a certain, nonelastic number of jobs in the economy?has been a persistent part of the cultural conversation, even though economists view it as a fallacy. 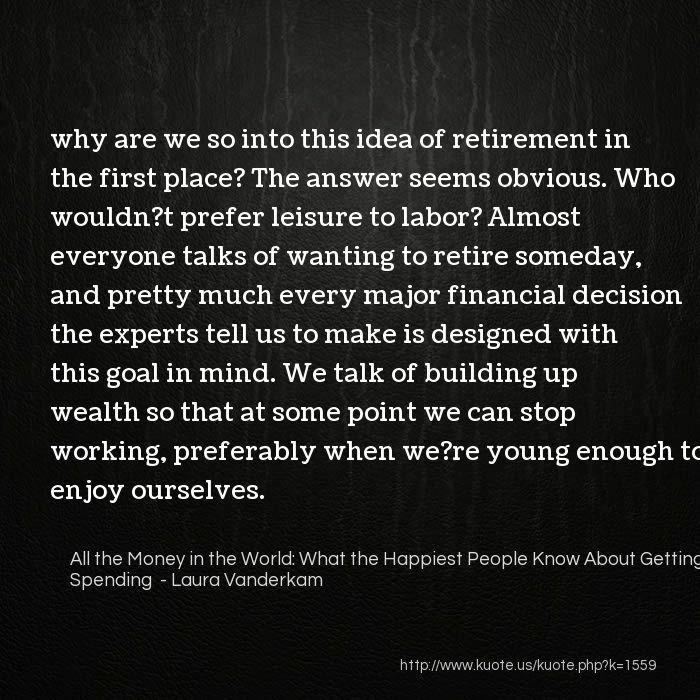 To me, what?s interesting about all this is how we got the notion of ?retiring? in the first place. In the past, many people?s retirement wealth came in the form of children who would take care of them when they grew old. 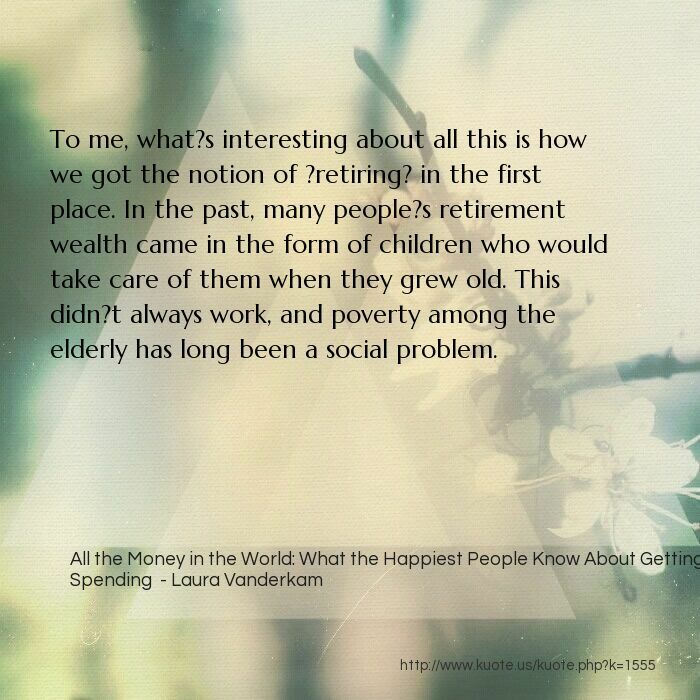 This didn?t always work, and poverty among the elderly has long been a social problem. There are more compelling reasons to build up wealth than simply to enable you not to work for the last 20 to 30 years of your life. 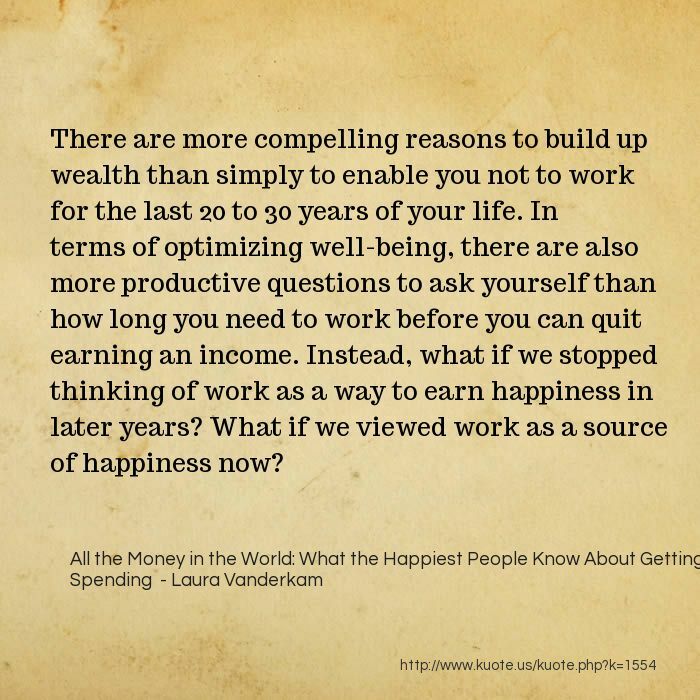 In terms of optimizing well-being, there are also more productive questions to ask yourself than how long you need to work before you can quit earning an income. Instead, what if we stopped thinking of work as a way to earn happiness in later years? What if we viewed work as a source of happiness now? people both need and want to be part of the workforce longer in an era of longer lives. 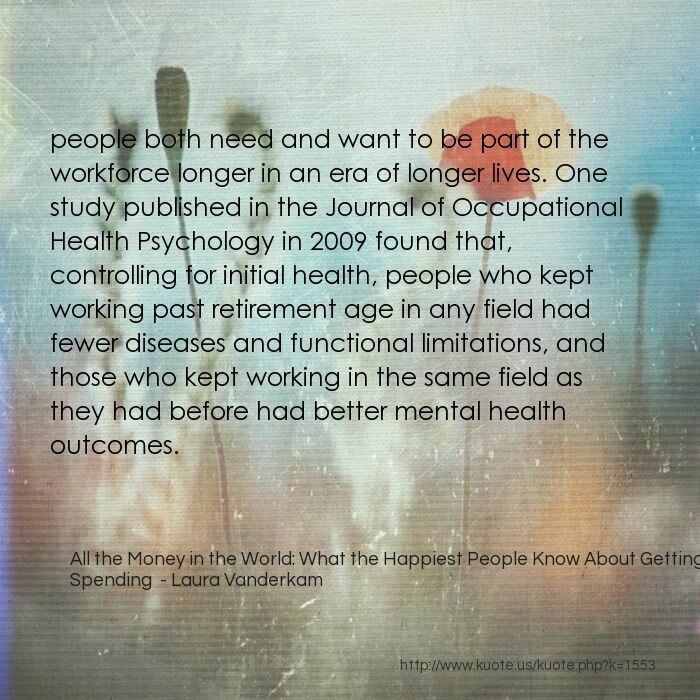 One study published in the Journal of Occupational Health Psychology in 2009 found that, controlling for initial health, people who kept working past retirement age in any field had fewer diseases and functional limitations, and those who kept working in the same field as they had before had better mental health outcomes. 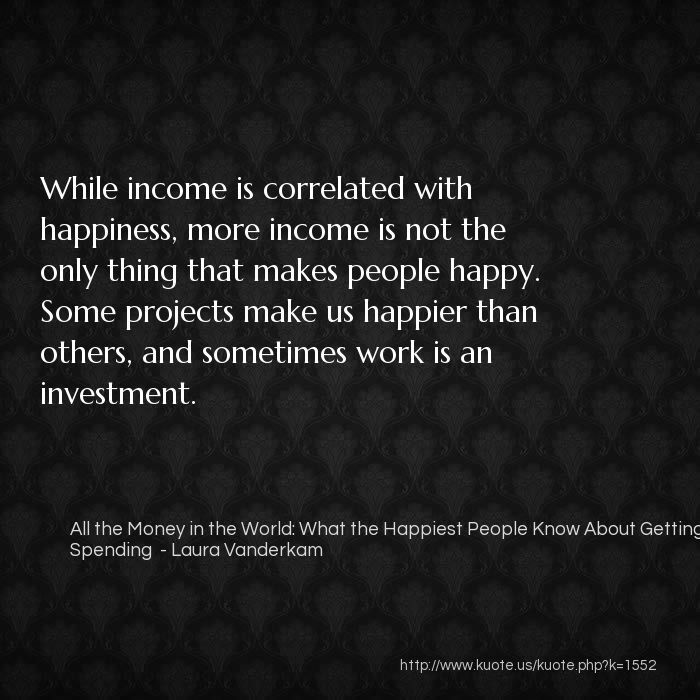 While income is correlated with happiness, more income is not the only thing that makes people happy. Some projects make us happier than others, and sometimes work is an investment. But many of us never even get to the first question?the how part?which is too bad. 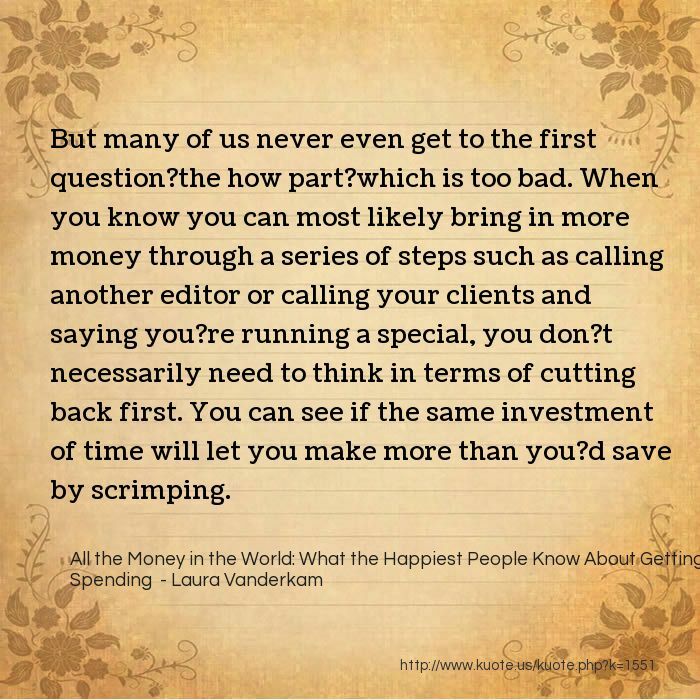 When you know you can most likely bring in more money through a series of steps such as calling another editor or calling your clients and saying you?re running a special, you don?t necessarily need to think in terms of cutting back first. You can see if the same investment of time will let you make more than you?d save by scrimping. The same concept applies to money. Rather than say ?I can?t afford it,? as long as ?it? 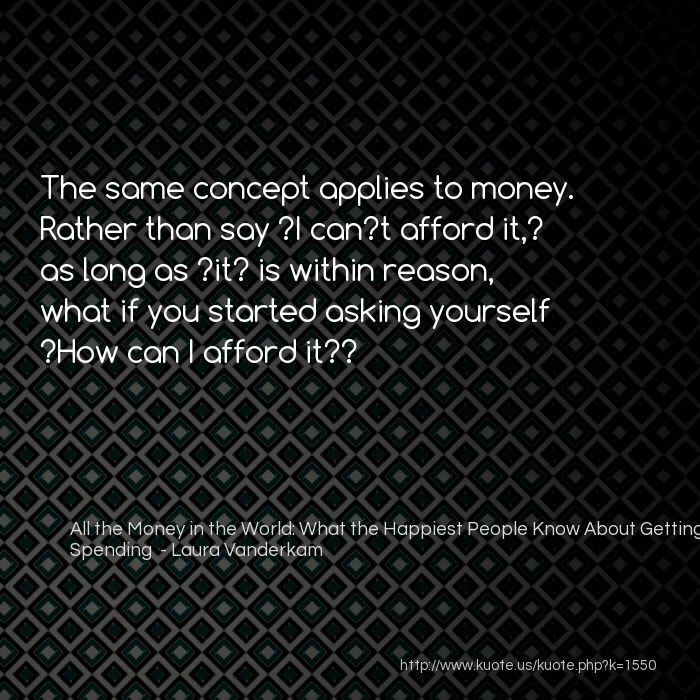 is within reason, what if you started asking yourself ?How can I afford it?? 3. How can I find these people? A better option is to train yourself to think like an entrepreneur. Broadly, you do this by asking three questions: 1. What skills do I have or can I learn that I enjoy using? ?There are plenty of basic life skills you may already have,? 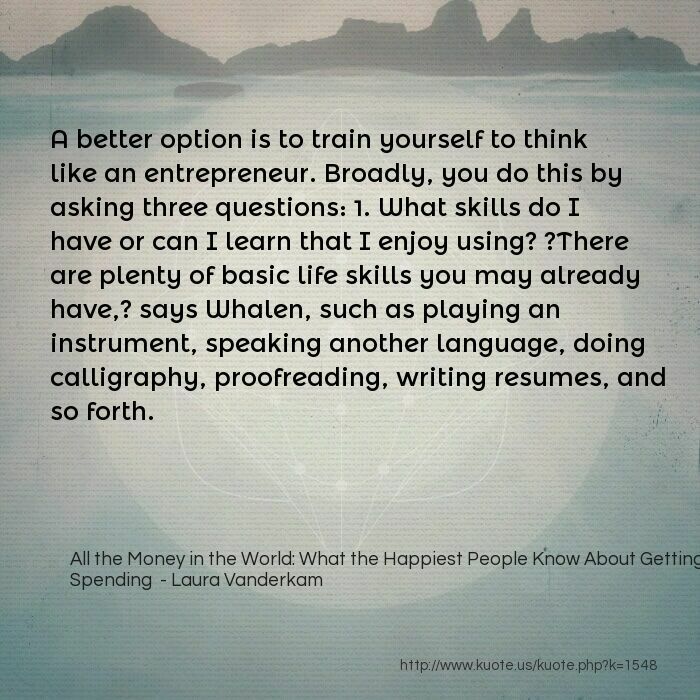 says Whalen, such as playing an instrument, speaking another language, doing calligraphy, proofreading, writing resumes, and so forth. 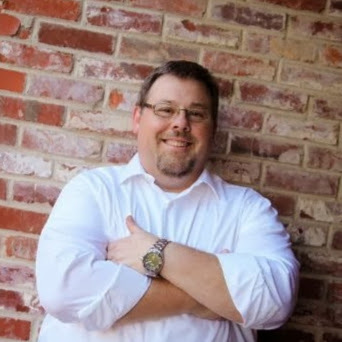 Here?s a question to ask yourself: would you be able to come up with an extra $2,000 in 30 days? 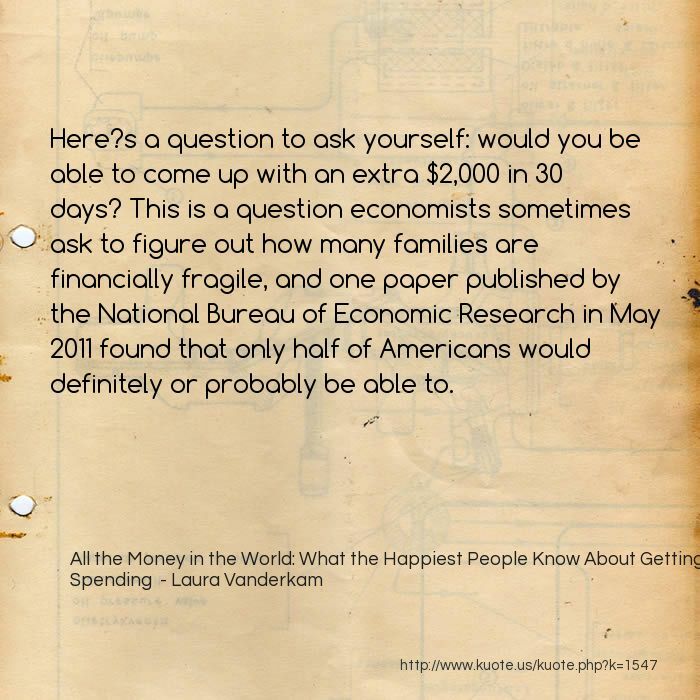 This is a question economists sometimes ask to figure out how many families are financially fragile, and one paper published by the National Bureau of Economic Research in May 2011 found that only half of Americans would definitely or probably be able to. 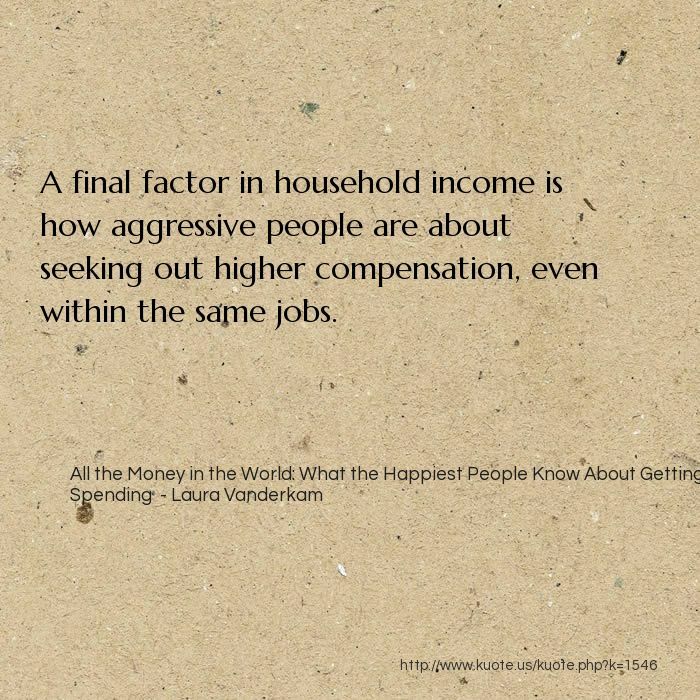 A final factor in household income is how aggressive people are about seeking out higher compensation, even within the same jobs. A third variable? How many hours those income earners work per week. A variety of surveys, including some from the Pew Research Center, have found that the majority of moms wish to work part-time. 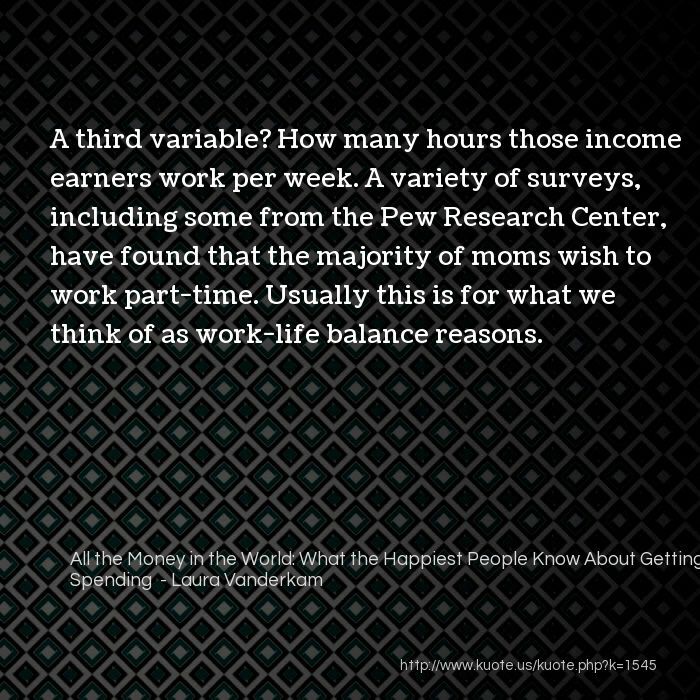 Usually this is for what we think of as work-life balance reasons. 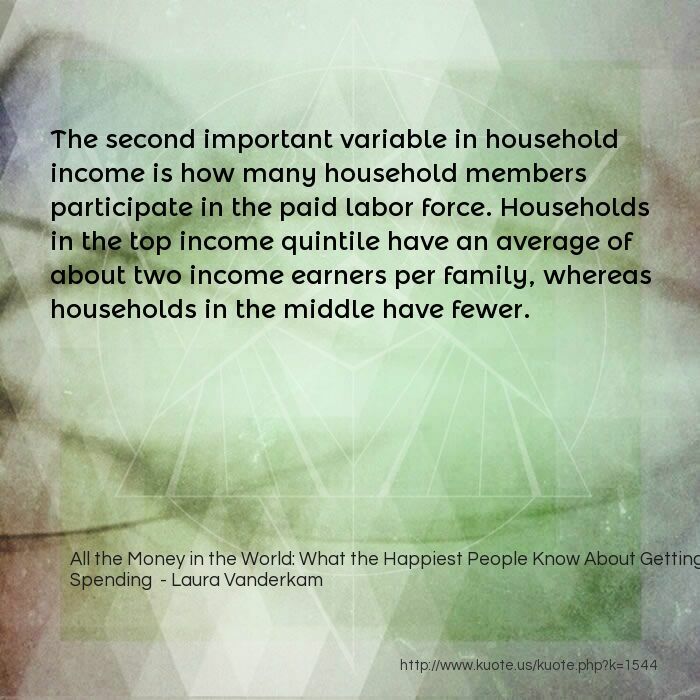 The second important variable in household income is how many household members participate in the paid labor force. Households in the top income quintile have an average of about two income earners per family, whereas households in the middle have fewer. But overall, people don?t spend all the extra money. 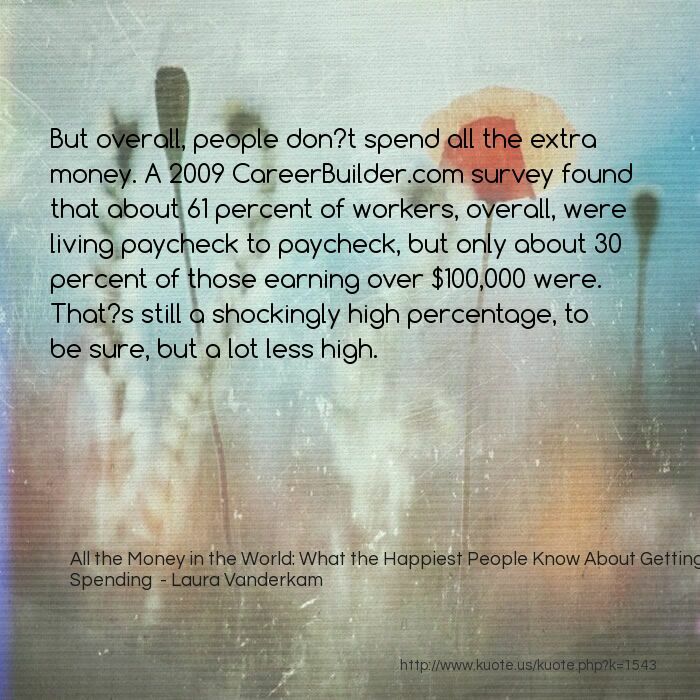 A 2009 CareerBuilder.com survey found that about 61 percent of workers, overall, were living paycheck to paycheck, but only about 30 percent of those earning over $100,000 were. That?s still a shockingly high percentage, to be sure, but a lot less high. 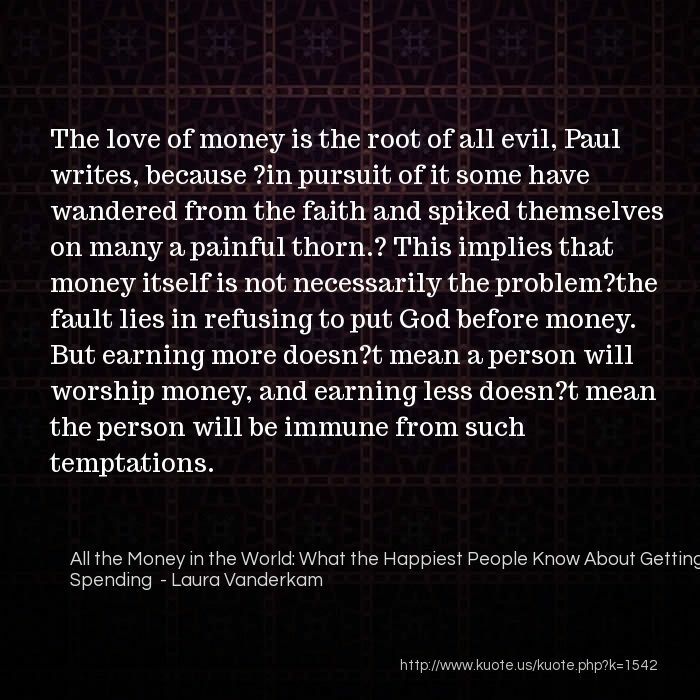 The love of money is the root of all evil, Paul writes, because ?in pursuit of it some have wandered from the faith and spiked themselves on many a painful thorn.? 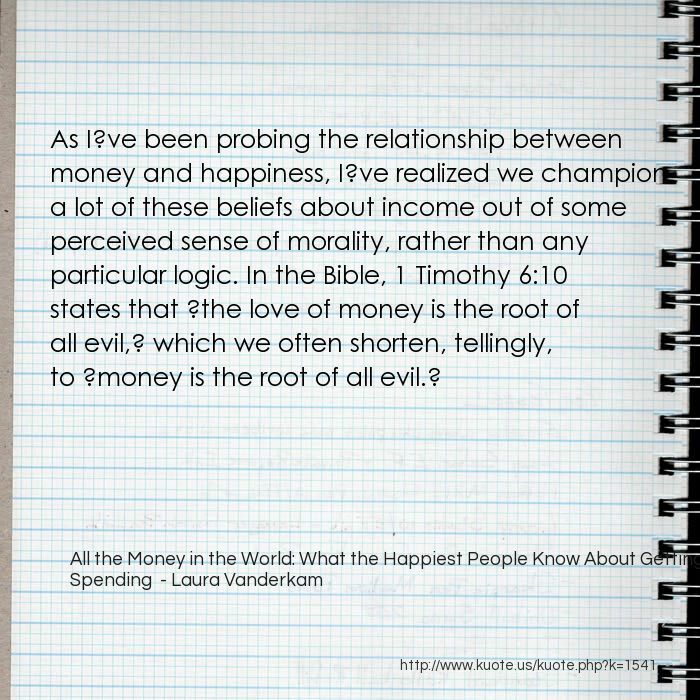 This implies that money itself is not necessarily the problem?the fault lies in refusing to put God before money. But earning more doesn?t mean a person will worship money, and earning less doesn?t mean the person will be immune from such temptations. 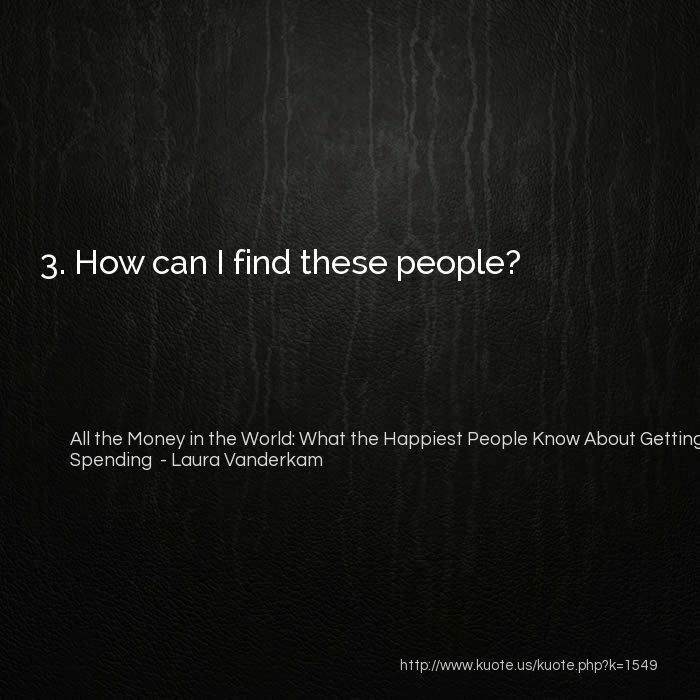 As I?ve been probing the relationship between money and happiness, I?ve realized we champion a lot of these beliefs about income out of some perceived sense of morality, rather than any particular logic. In the Bible, 1 Timothy 6:10 states that ?the love of money is the root of all evil,? which we often shorten, tellingly, to ?money is the root of all evil. ?